Oh my goodness! I don’t know how many times had I dreamed about this day – the day that Mikan can get out of her quarantine suite (master bathroom and closet combined for luxury) and she can explore everywhere in the house (she might think our house is a huge castle!). 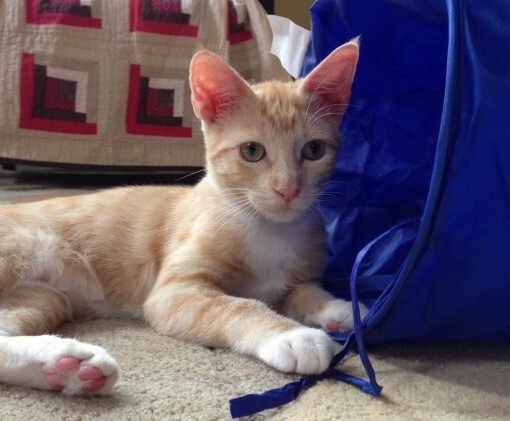 Finally, she can live with all of us – yes, ringworm is OVER. The most exciting thing was to observe the re-introduction of Mikan and Tora again after 11 weeks! 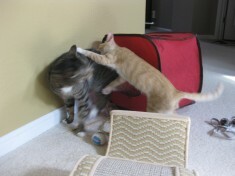 Both cats briefly met in late August before Mikan started to show various sickly symptoms. I was little anxious and nervous about this process this time. I was just crossing my fingers hoping everything would go well. As soon as the door opened, Mikan dashed out of her “cell”, and there was her long-awaiting brother, Tora, with open paws (OK, I am imagining things). In reality, Tora was sitting there to greet her with his extended neck. 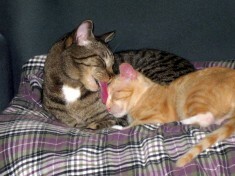 Then, he started licking the top of Mikan’s head right away! Mikan was so excited to see something new, so she couldn’t sit still for Tora. She took off to other new areas of the house to explore. Tora chased her everywhere. They were both hyper-active as if they couldn’t contain their emotions of excitement and joy! Today, on the fourth day of Mikan’s integration to the family, I am so thankful that Mikan is doing extremely well. She looks as happy as a clam, jumping and galloping everywhere. She already has a set of permanent canines, too. It was wild to see her baby teeth canines and permanent canines existed side by side for about two weeks. We will surely continue feeding her high quality homemade raw meat with right supplements for her. I’ve learned that Omega 3 (Salmon oil) and turmeric have been a big help for her skin condition in addition to our daily supplements. Since Mimi passed in late June, Tora has been mellower than before. He adapted himself to be an only cat in the house, acting like a human rather than a cat, in my opinion. However, Mikan brought him back to his natural state – being a cat again! He runs so fast that my eyes cannot follow his movement. He has distinct moments of being active and being relaxed. In his relationship with Mimi, he was instigator and Mimi had to hiss at him in order to let him know “enough is enough”. Now, Tora hisses to Mikan to let her know “too much is too much”. All is well. My husband and I felt big relief this week. We sat in our backyard with our favorite Green Tea Latte from Starbucks this afternoon, and took this happiness ALL IN. Welcome, little sister to your home and family! Life is sweet. "Do I look beautiful now?" Yay for Mikan and Tora! Congratulations to the whole family — Your journey with Mikan makes a wonderful Thanksgiving story! Have You Spoiled Your Cats Lately? Frances Porter on Have You Spoiled Your Cats Lately? copyright © 2019 balanced cats. Website by Karen Barry Creative Development.